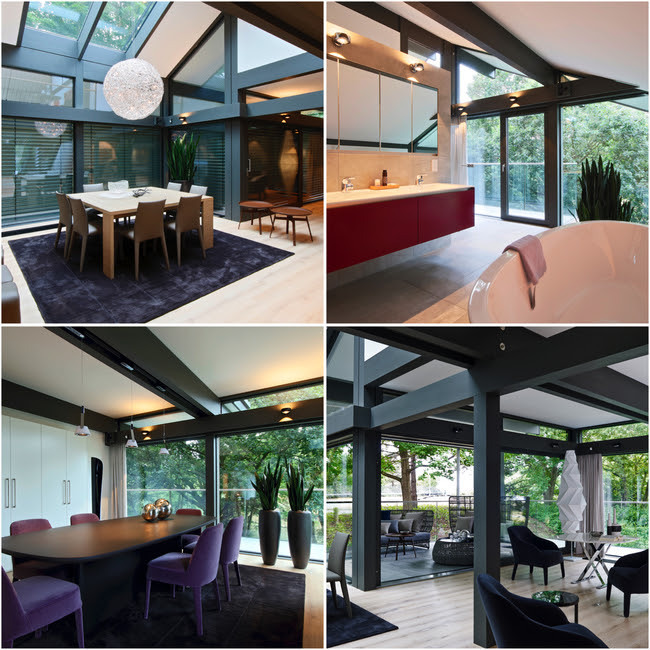 HUF HAUS, the company who pioneered high-end pre-manufactured timber and glass homes, has launched their first ever UK show house, which is located in Weybridge, Surrey. 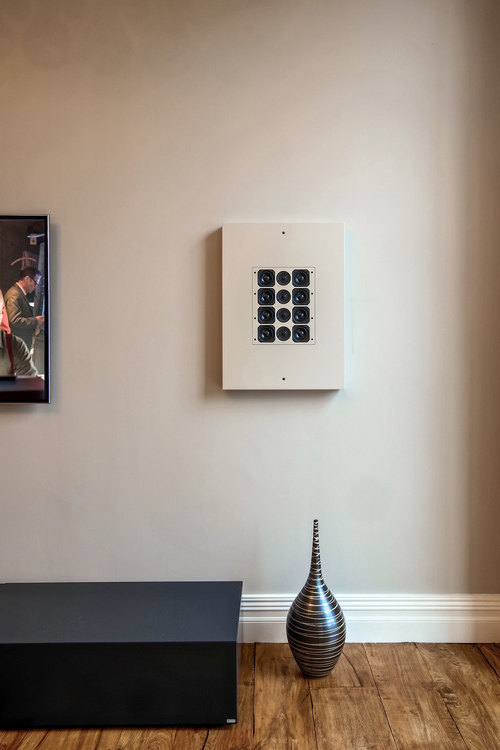 With stunning attention to detail throughout the incredible property, they called on Challenge Control to help design and integrate the technology and high quality audio system. Artcoustic Target SLs are used in nearly every room, installed onto the beams, and colour matched to blend in beautifully. The result is stunning, providing high quality audio throughout this amazing property. Artcoustic Target SLs can be seen on the high level beams, if you look closely enough for them. Challenge Control designed the whole system, in close consultation with Huf Haus to ensure the system was capable of the high quality their clients expect, as well as being very simple to use. November's Installation Of The Month is really something very special indeed. Integration Design in Sweden were given the brief to design and install this amazing room for a world leading music company. Sweden's top media company needed an auditorium for internal and external gatherings, press conferences and various media presentations. Something out of the ordinary was required in order to reflect the cutting-edge image of the company. Integration Design designed everything from the room's shape, inspired by Prada's HQ in New York, to the unique audio-visual system with a 6.3m wide curved projection screen with three professional high-resolution projectors working together. Two pictures can be displayed side-by-side or edge-blended into one super-wide image. For a maximum impact the master projector is activated, generating a massive 2.35:1 cinemascope picture over the entire screen. The audio system consists of six Artcoustic Performance P12-6, teamed up in pairs and angled apart vertically for a perfect sound dispersion along the elevated seating area. Four Artcoustic Spitfire Control 3 subs delivers chest-pounding bass from behind the acoustically transparent screen. Eight Artcoustic Multi Soundbar SLs are installed for side surrounds and the Dolby Atmos overhead speakers. The design was topped off with Philips Large Luminous textile panels. Capable of generating stunning visual effects such as fire, stars, water and much more over 54 sqm - it is Europe's largest ceiling installation of Philips Large Luminous textile panels to date. This amazing installation shows the incredible depth and versatility of the Artcoustic range of loudspeakers. Artcoustic is one of the few brands that can offer the same designs, concepts and options for large high end screening rooms such as this, all the way through more accessible cinema systems using Spitfire 4-2 or 6-3s, and even to contemporary designed, Farrow & Ball colour matched, Target SLs and Diablos SLs for beautiful interior designed spaced, and bespoke sized LCR Soundbars. October's Installation Of The Month is this beautiful project, installed by Home Entertainment Direct! Artcoustic 75-55 SL 8-4s are installed either side of the TV providing superb stereo sound quality.The system delivers superb picture and sounds, whilst working beautifully within the stunning interior design. 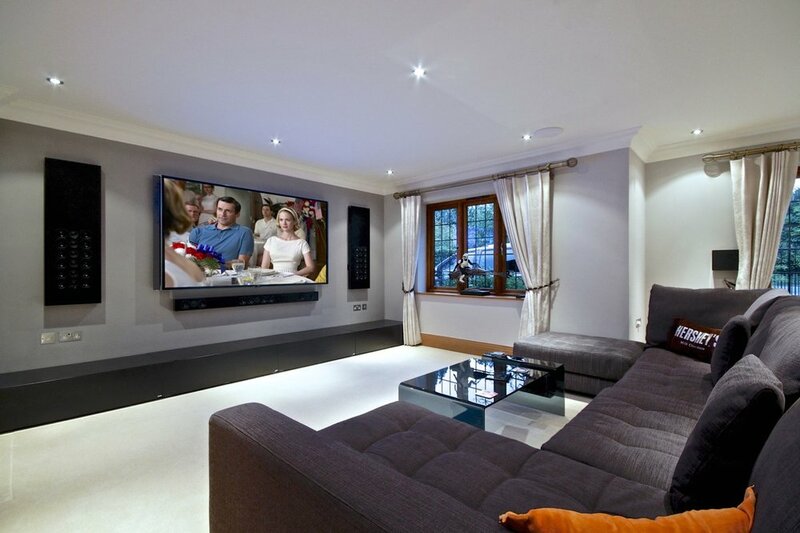 The TV is used for enjoying general TV, with a drop down screen coming down for movies and important sporting occasions. 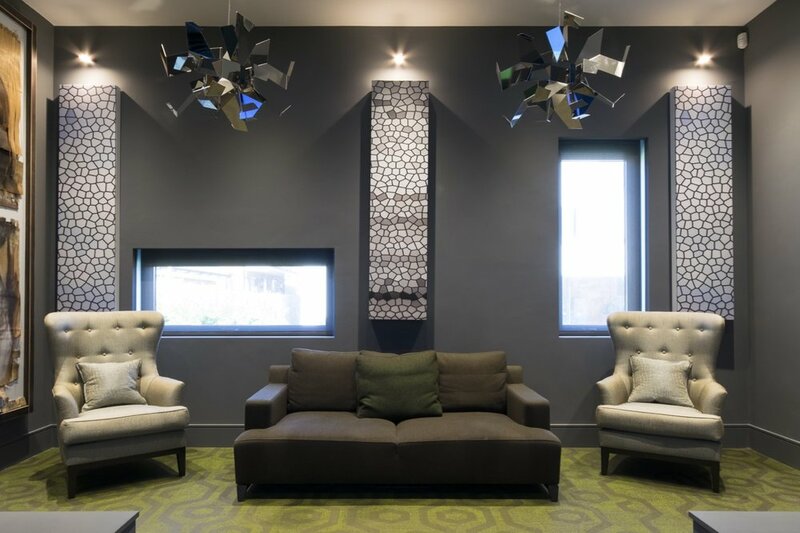 The system was designed with a visit from the client and the interior designer to the Artcoustic UK showroom, with Cherie Lee Interiors embracing the combination of high quality performance and flexible aesthetics of the Artcoustic speakers for the project. The speakers were colour matched to the Farrow & Ball Cornforth White walls, using the new colour matching service now available from Artcoustic. We can now match to any paint reference, so no longer do we need the closest RAL. If you want the speakers the same colour as your favourite from F&B, Zoffany, Little Greene, Paper and Paint, Dulux......we can do it. 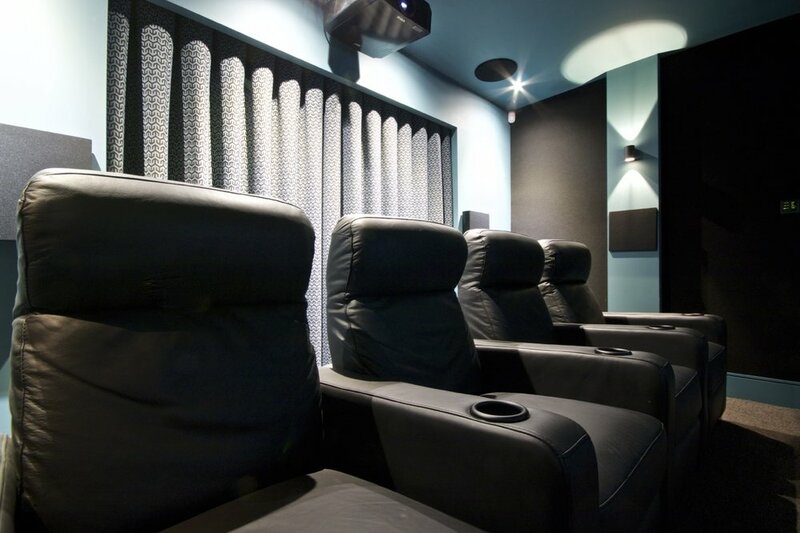 Avolution take September's Installation Of The Month for this incredible private cinema in Guernsey! Dan and the team designed, installed and calibrated the entire room, ensuring a technically perfect room, as well as stunning aesthetics. Artcoustic Spitfire 24-12 are installed for left, centre and right channels behind the acoustically transparent screen, as all well designed cinemas do. Spitfire Control subwoofers are also installed behind the screen. Colour matched Diablo SLs are used for the rear channels ensuring timbre matching, whilst working seamlessly with the design of the room. 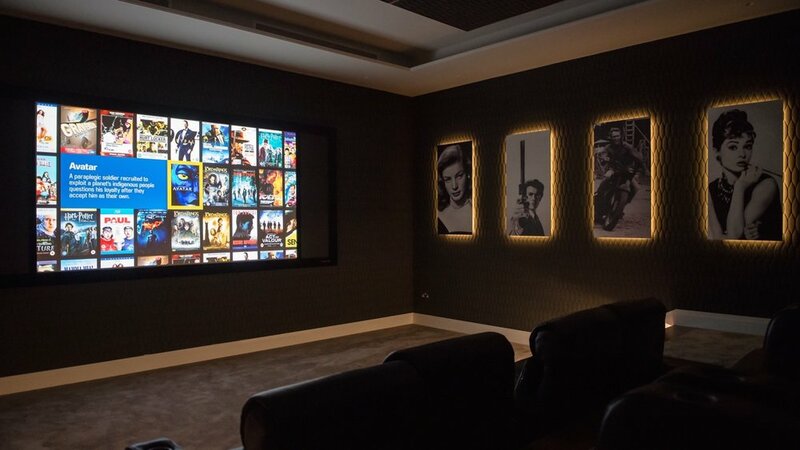 The end result is an amazing private cinema room, with incredible sound and picture, all simple to use and control with wonderful attention to detail. A very deserving winner of September's Installation Of the Month. The acoustically transparent screen includes side masking for perfect transition from 16:9 content such as sport, to 2.35:1 ratio for that truly cinematic experience. Philharmonic AV are the deserving winners of August's Installation Of The Month for the amazing technology and audio quality in their new CEDIA Award nominated showhome. The 4800 sq. ft. seafront property caters for all the needs of both potential clients and design professionals, showcasing a multitude of technology solutions. Amongst them are the incredible Dolby Atmos 7.1.4, Artcoustic Spitfire private cinema, and the amazing golf simulator, the most advanced of its type in the UK. The cinema room was carefully planned and designed to deliver the optimum performance, naturally choosing to install Dolby Atmos (and ready for DTS:X). The 7.2.4 system comprises of Artcoustic Spitfire 8-4s for the LCR behind the acoustically transparent screen, with Artcoustic 40-30 SL 4-2 for side and rear speakers, and Architect SL 4-2s for the overhead speakers. 2 x Artcoustic Spitfire Control 2 Subwoofers deliver the all important LFE. Meticulous planning by the team at Philharmonic AV ensured all the correct loudspeaker locations and screen size resulted in the very best experience possible. The cinema is superbly installed, with excellent attention to detail throughout. Not only are Artcoustic Loudspeakers used in the private cinema, but they are also employed in the state of the art golf simulator. 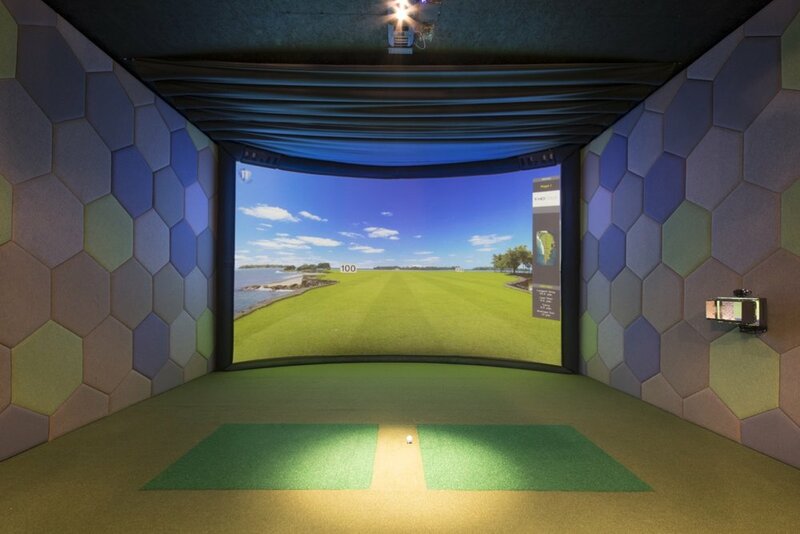 This is the biggest and most advanced golf simulator in the UK, and the room is of course connected to the Savant control system to access all the music and media required when enjoying 18 virtual holes. Artcoustic 180-43 SLs are used in stereo, with printed screens from the Artcoustic Art Gallery to work elegantly within the beautiful interior design. The result is stunning! 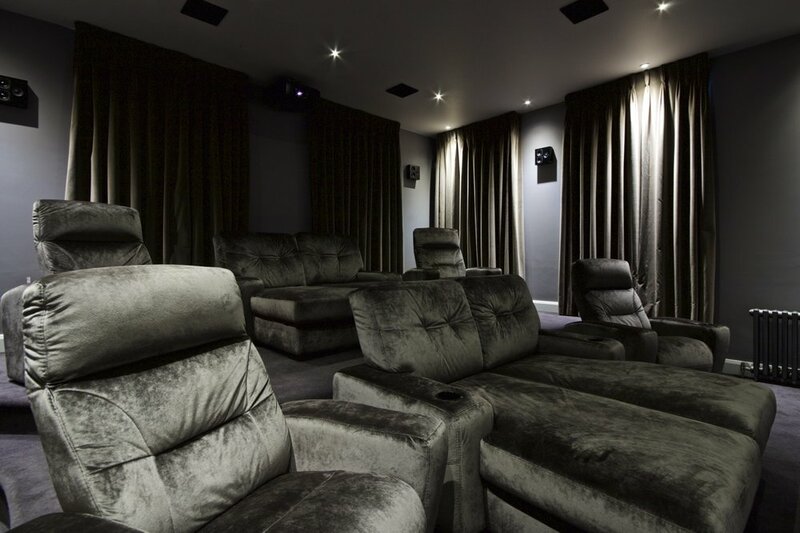 Q Smartdesign are the deserving winners of July's Installation Of The Month for this incredible private cinema for leading cricketer, Kevin Pietersen. The room was carefully planned and designed to deliver the optimum performance, naturally choosing to install for Dolby Atmos and DTS:X. The 7.2.4 system comprises of Artcoustic Spitfire 16-8s for the LCR behind the acoustically transparent screen, with Arcoustic Diablos for side and rear speakers, and Architect SL2-1s for the overhead speakers. 2 x Artcoustic Spitfire Control 2 Subwoofers delivery the all important LFE. The speakers are powered from a Denon integrated amplifier, which sounds amazing, in part due to the 101db sensitivity of the LCRs. The end result, with incredible sound, stunning picture and luxurious Cine Italia seats, is a cinema to be very proud of indeed. Congratulations to Andy, Alastair, Chris and the whole team at Kent Home Cinema for this amazing private cinema. This amazing system features Artcoustic Spitfire 8-4 speakers behind the acoustically transparent, 4K Screen Excellence screen, with the new Performance Sub also behind the fabric wall. Diablo SLs and Architect SL 2-1s make up this Dolby Atmos 7.1.4 system, alongside other products like the Front Row seats, Sony 4k projector and Denon amplification. This is a stunning room with great attention to detail, and with the correct design right from the start to ensure the very best picture and sound possible. When the client approached Kent Home Cinema, the initial brief was 'I think I'd like a bigger TV'. Kent Home Cinema arranged for a demonstration at Artcoustic's UK showroom, and very quickly the brief changed and discussions soon turned to what would be possible within the room. Together with Kent Home Cinema, we put together a proposal, designed to Dolby's guidelines, and produced 3D renders. This excited the client and from site visit to the finished amazing cinema was complete within 4 short weeks. Installed by Kent Home Cinema. Congratulations to Chris and the team at Realtime in the UK for this beautiful installation. The attention to detail, and quality of work throughout the property is exceptional. Artcoustic Target SL speakers were chosen to deliver quality audio in the key rooms in this superbly designed London property. At just 200 x 200 x 60mm, the Target SL is one of the most popular models in the range, and is often supplied in bespoke colours requested by the client or interior designer. In this case, white was just perfect. Congratulations to Paul and the team at MD Integration in the UK for this incredible installation. This dedicated basement cinema is installed as a Dolby Atmos 7.1.4 system, and looks and sounds amazing. Using Artcoustic Spitfire 16-8 loudspeakers for the LCR behind the acoustically transparent Screen Excellence screen, together with 2 x Artcoustic Spitfire Control 3 Subwoofers. This amount of power in a room this size is truly something to behold! The rear and side speakers are Artcoustic Target SL and Architect SL 2-1, with these installed into the wall to save valuable space along the walkway to the back row. Four Architect SL 2-1s are installed in the ceiling for the overhead Dolby Atmos speakers, completing this system. It is all powered from a Denon integrated receiver. 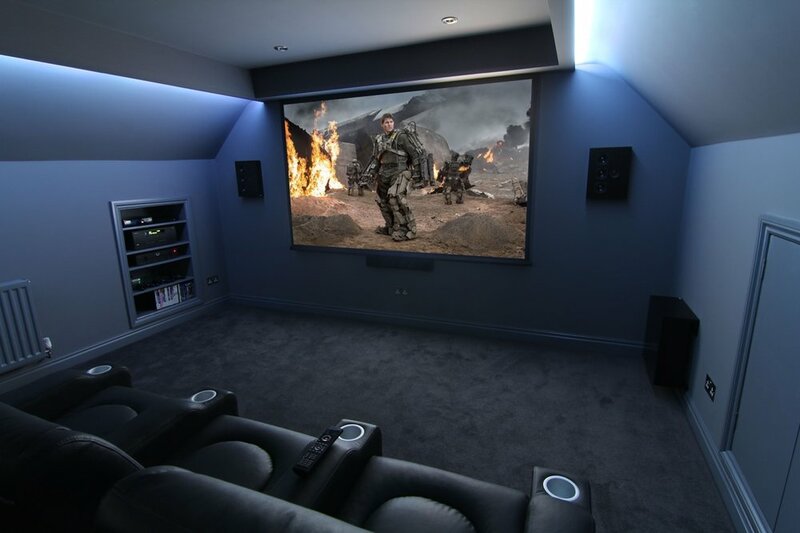 Congratulations to Bespoke Home Cinemas in Leeds, UK, for March's superb Installation Of The Month! This system is installed into a client's loft that was being used as a games room. They wanted to upgrade the whole room and enjoy a private cinema for their family and friends. Gifford and the team have designed, installed and calibrated an amazing system at a very sensible price point. The screen is installed so that it drops down over the existing window making excellent use of the space available. Using Artcoustic Diablo SLs and C-1 SL with Modular SL for rear, and a Panel Sub Micro for LFE, the system delivers superb performance in a 5.1 configuration. The endless loudspeaker colour options also allowed for the aesthetics to be properly considered. Arcam, JVC and Signature Seating and Control 4 complete the system. Congratulations to Smartcomm for February's beautiful Installation Of The Month! 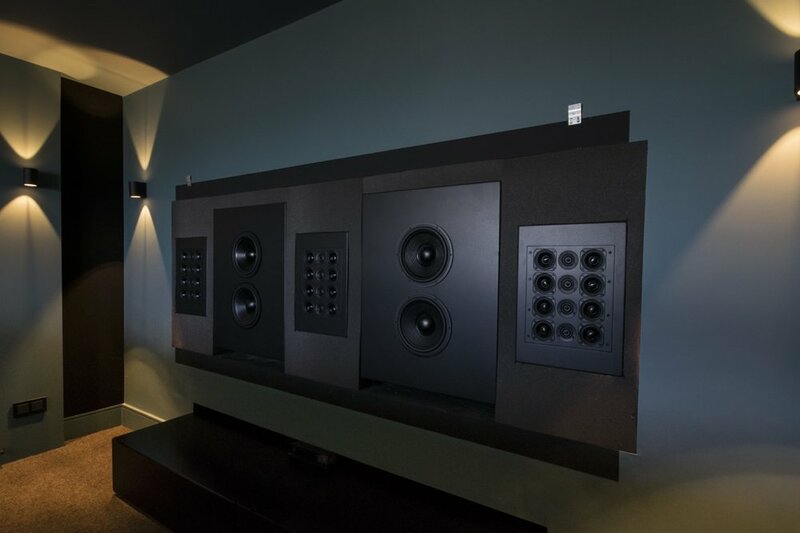 The client came over to our UK showroom and experienced our new Dolby Atmos cinema room and was completely blown away. 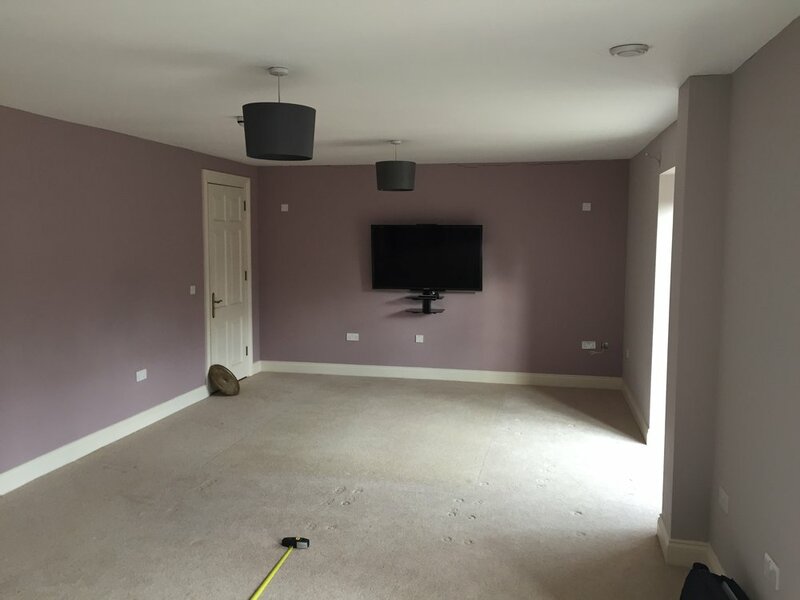 We then helped Smartcomm to design a 7.1.4 Dolby Atmos system for the client's home, using a large TV rather than a projector. The same care and attention went into this as any dedicated cinema room, and the resulting performance is breathtaking. Artcoustic 120-36 SL speakers are used for left and right channels, with a Multi SL Soundbar for centre channel, Target SL for rear and side, and Architect SL for the overhead speakers. 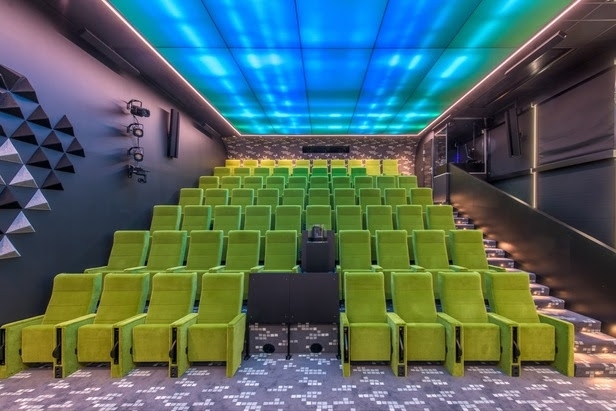 This installation demonstrates that incredible Dolby Atmos systems can be installed in a more relaxed lounge environment than solely dedicated cinema rooms, as long as the system is designed correctly, and with the right products. 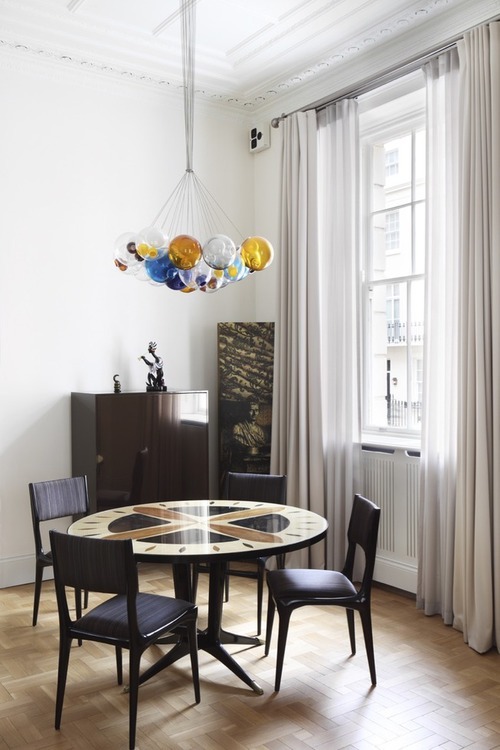 We kick off 2015 with a superb installation for January's Installation Of The Month. This amazing system is installed in Marbella, Spain by Illusion and features Artcoustic 120-36 SL, Diablo SL and a Spitfire Control 2 Subwoofer. Luxurious but comfortable, with superb picture and sound delivered for a sensible budget, this system delivers a genuinely cinematic experience.